AutomationDirect has added more AC, DC and analog I/O modules to increase the capabilities and versatility of the Productivity1000 micro-modular PLC. 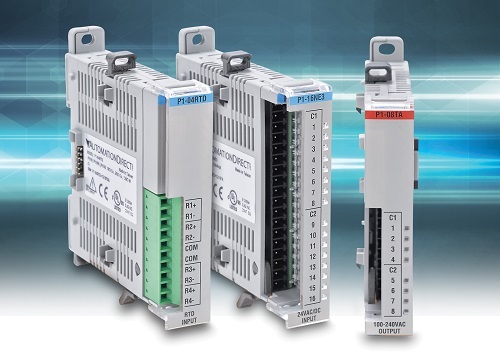 The micro stackable P1000 PLC system provides communications, user-friendly programming, integrated data storage, and a full lineup of discrete, analog and specialty I/O modules in a super-compact size. The P1000 PLC system can be expanded with up to 8 I/O modules for a total of 128 discrete I/O points or 48 analog I/O channels. 8-point 120-240V AC input and output modules have been added; new analog I/O includes RTD 4-channel input and combination 4-channel input, 2-channel output, 0-20 mA and 0-10 VDC modules. Starting at $33.50, I/O modules are auto-discovered and easily added / removed using a single latch mechanism. There are no module placement restrictions and no power budget limitations. QR (Quick Response) codes are printed on each module for the latest specifications / wiring diagrams. The complete line of Productivity1000 components can be seen at www.automationdirect.com/P1000.